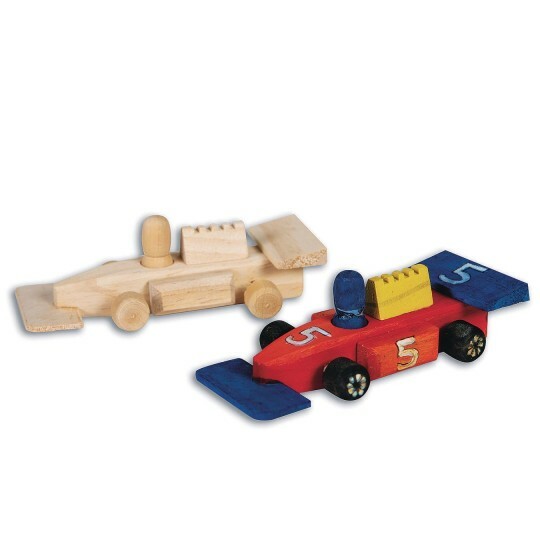 You're the pit crew in a race to assemble and paint fun wooden racers. Includes car, driver and instructions. Fun and easy activity. We used it for ages 5 to 10 and students were able to work independently to put together and decorate the cars. Very important: the wheels do not rotate. We assemble them at home and then sell them at farmers market for the kids and adults to paint at our booth. If the wheels reached the ground and the cars would roll they would be more appealing to our customers. I ordered these for our VBS and was very disapointed! These cars are very small and the wheels don't work. Once you get all the parts glued on there is not much room to decorate. We glued the cara together the night before and them the kids at my sons 5th birthday party painted them. Most of them don't roll well but they loved decorating them and taking them home.